Temperance (Tempe for short) is now 5 months old. Her adoptive parents Jonathan and Kate, reside in Fort Huachuca Arizona and had the blessing of meeting Tempe when she was just 6 days old. Tempe’s adoptive father is a Sergeant First Class in the Army and her mother is home with the family – caring for her and her three sisters: Malanie, Avery and Mackenzie (ages 13, 12 and 10 respectively). Her expected adoption completion ‘gotcha’ date is May 5, 2017. Tempe’s journey to her gotcha day has not been without challenges. At birth she was rushed to the NICU where she spent the first three weeks of her life. From there, she was in a ‘step down’ unit at the hospital for another week before she could go home with her family. Her hospital stay was a result of exposure to methadone while she was developing in utero. According to medical professionals methadone detoxification is a difficult process that is especially grueling to a newborn child. It often is accompanied by months of sleepless nights, gastrointestinal upsets, tremors and a general feeling of aches all over without much of anything that can be done to get a feeling of comfort. Because many families are not able to or interested in moving forward with the adoption of a child who has such exposure, the professionals worked diligently on Tempe’s behalf to find a family that was qualified and a perfect match for her. The family, while planning to adopt, was asked to proceed with Tempe’s adoption well before they thought an adoption match might be possible. Without a “yes” from Gift of Adoption to help complete Tempe’s adoption this coming May, the family said this adoption would have been at risk of not moving forward or of serious delay. 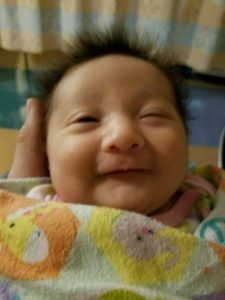 Seeing the giggles and smiles and developmental milestones that Tempe is meeting – they could not be more grateful for everyone and everything that needed to come together for Tempe move immediately from the hospital to being welcomed into their loving family. Using the donation form below, you can make a donation in honor of Tempe’s adoption grant. We are grateful for your support!